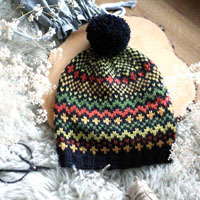 Go to original pattern for design DROPS 199-24. 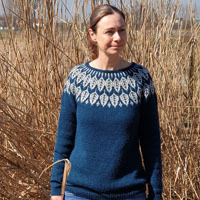 Knitted jumper with round yoke in DROPS Air. The piece is worked top down with lace pattern and balloon sleeves. Sizes S - XXXL. 16 stitches in width and 20 rows in height with stocking stitch = 10 x 10 cm. DROPS CIRCULAR NEEDLE SIZE 5.5 MM: length 40 cm and 80 cm for stocking stitch. DROPS DOUBLE POINTED NEEDLES SIZE 4.5 MM. 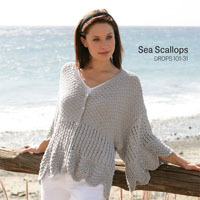 DROPS CIRCULAR NEEDLE SIZE 4.5 MM: length 40 cm and 80 cm for garter stitch edges. 1 ridge in height = 2 rounds. Knit 1 round and purl 1 round. To work out how to increase evenly, count the total number of stitches on the needle (e.g. 220 stitches) and divide by the number of increases to be made (e.g. 8) = 27.5. 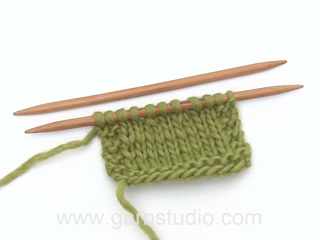 In this example, increase by making 1 yarn over after alternately each 27th and 28th stitch. On the next round knit the yarn overs twisted to avoid holes. Increase to raglan on each side of the 4 marker threads in each transition between back/front piece and sleeves as follows: Start 1 stitch before the marker thread, make 1 yarn over, knit 2 (marker thread sits between these 2 stitches), 1 yarn over (= 2 stitches increased at each marker thread and a total of 8 stitches increased on round). On the next round knit the yarn overs twisted to avoid holes. The yoke is worked in the round with circular needle, top down. The yoke is divided for body and sleeves. The body is continued in the round with circular needle, top down. 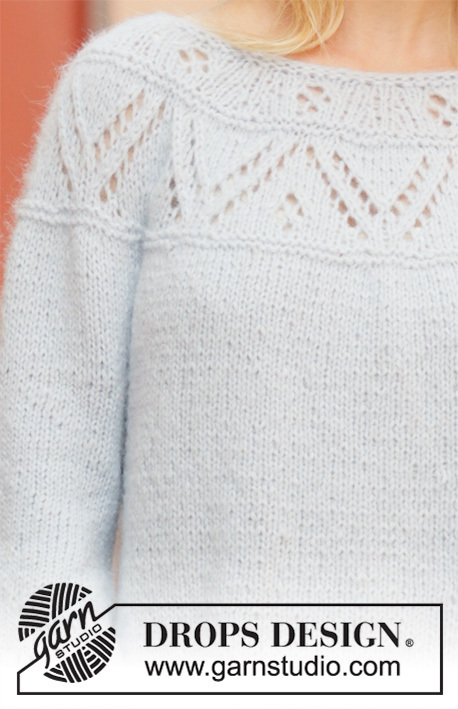 The sleeves are worked in the round with short circular needle/double pointed needles, top down. Cast on 80-80-88-88-96-96 stitches with short circular needle size 4.5 mm and Air. Work 2 RIDGES in the round – read description above. Change to circular needle size 5.5 mm and work A.1 in the round (= 10-10-11-11-12-12 repeats of 8 stitches). REMEMBER THE KNITTING TENSION! NOTE: On the round marked with an arrow in A.1 displace the start of the round 1 stitch to the left; i.e. 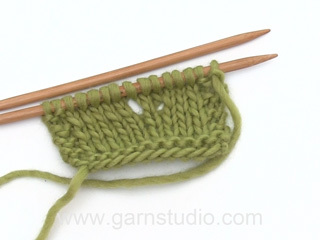 slip the first stitch onto the right needle without working it, then work A.1 in the round. The stitch which was moved onto the right needle will be worked in the last repeat of A.1. The next round starts as normal. When A.1 has been completed there are 220-240-264-264-288-312 stitches on the needle and the piece measures approx. 18-18-18-18-18-20 cm from the cast-on edge. Then work as described below. Work stocking stitch in the round. AT THE SAME TIME when the piece measures 19-20-21 cm from the cast-on edge increase 8-12-8 stitches evenly spaced = 228-252-272 stitches. Work stocking stitch without increasing until the piece measures 21-23-25 cm from the cast-on edge. 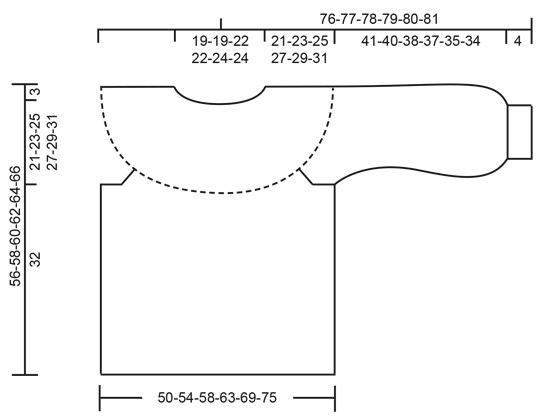 Now divide the yoke for body and sleeves as described under ALL SIZES. 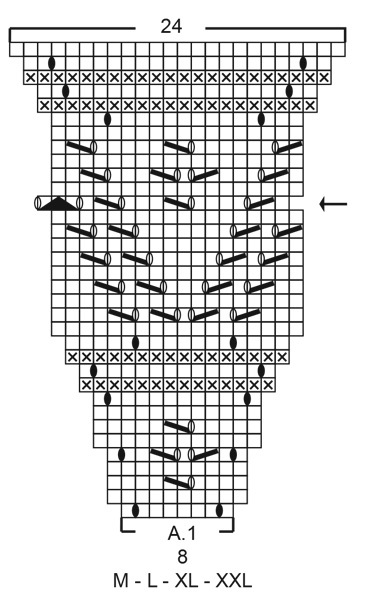 Insert 4 marker threads in the piece as described below (without working the stitches). The will be used when increasing to raglan. Count 42-46-51 stitches (= ½ back piece), insert 1 marker thread before the next stitch, count 48-52-54 stitches (= sleeve), insert 1 marker thread before the next stitch, count 84-92-102 stitches (= front piece), insert 1 marker thread before the next stitch, count 48-52-54 stitches (= sleeve), insert 1 marker thread before the next stitch. There are 42-46-51 stitches left after the last marker thread (= ½ back piece). Work stocking stitch in the round. 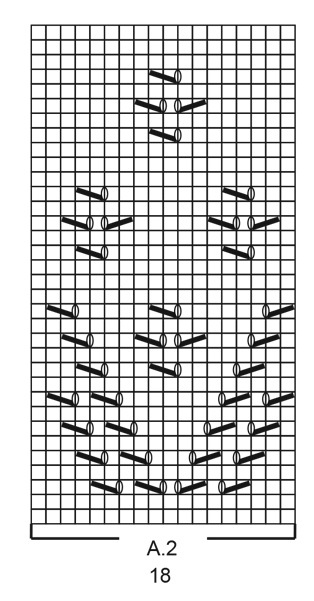 AT THE SAME TIME on the first round increase to RAGLAN on each side of the 4 marker threads – read description above. Increase to raglan every 4th round a total of 4-5-5 times. After the last increase there are 296-328-352 stitches on the needle. Work stocking stitch without increasing until the piece measures 27-29-31 cm from the cast-on edge. Now divide the yoke for body and sleeves as described under ALL SIZES. 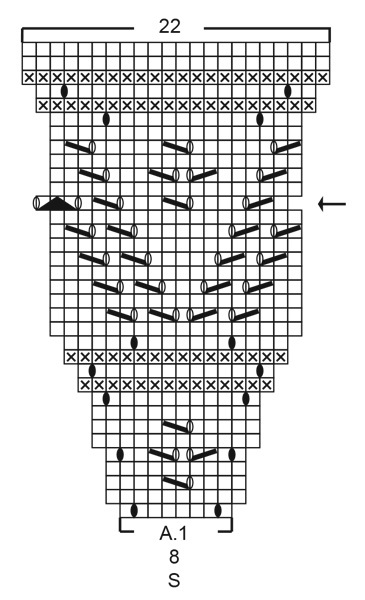 The yoke is divided for body and sleeves as follows: Knit 37-40-42-46-51-56 stitches (= ½ back piece), place the next 40-46-52-56-62-64 stitches on 1 thread for sleeve, cast on 6-6-8-8-8-8 new stitches on needle (= in side under sleeve), knit 74-80-84-92-102-112 stitches (= front piece), place the next 40-46-52-56-62-64 stitches on 1 thread for sleeve, cast on 6-6-8-8-8-8 new stitches on needle (= in side under sleeve) and knit the remaining 37-40-42-46-51-56 stitches (= ½ back piece). Cut the strand. Body and sleeves are finished separately. THE PIECE IS NOW MEASURED FROM HERE! = 160-172-184-200-220-240 stitches. Start the round on the one side of the piece in the middle of the 6-6-8-8-8-8 stitches under the sleeve. 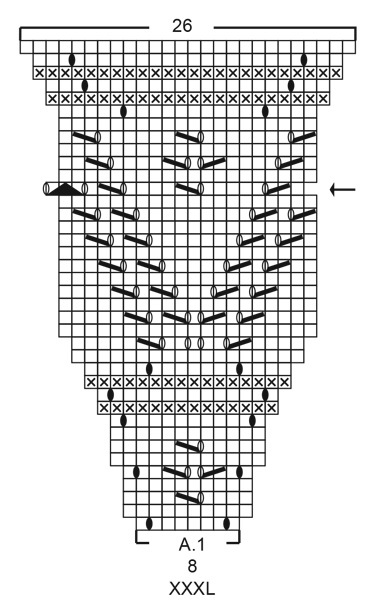 Work stocking stitch in the round until the piece measures 30 cm from the division (or to desired length; there is approx. 2 cm left to finished length). Change to circular needle size 4.5 mm and work 3 ridges in the round. Loosely cast off with knit. The jumper measures approx. 56-58-60-62-64-66 cm from shoulder down. Place the 40-46-52-56-62-64 stitches from thread on one side of the piece on short circular needle/double pointed needles size 5.5 mm and knit up 1 stitch in each of the 6-6-8-8-8-8 stitches cast on under the sleeve = 46-52-60-64-70-72 stitches. Insert 1 marker thread in the middle of these 6-6-8-8-8-8 stitches and allow it to follow your work onwards. Start the round by the marker thread and work stocking stitch in the round. When the sleeve measures 3 cm from the division decrease 2 stitches mid under sleeve – read DECREASE TIP! Repeat the decrease when the sleeve measures 6 cm from the division = 42-48-56-60-66-68 stitches. When the sleeve measures 14-13-11-10-8-8 cm from the division, increase 10-8-5-10-8-7 stitches evenly spaced = 52-56-61-70-74-75 stitches. When the sleeve measures 17-16-14-13-11-11 cm from the division, increase 10-8-5-10-8-7 stitches evenly spaced = 62-64-66-80-82-82 stitches. When the sleeve measures 20-19-17-16-14-14 cm from the division, increase 10-8-6-10-8-8 stitches evenly spaced = 72-72-72-90-90-90 stitches. Continue working without increasing until the piece measures 23-22-20-19-17-16 cm from the division (shorter measurements in larger sizes due to wider neck and longer yoke). Work A.2 in the round (= 4-4-4-5-5-5 repeats of 18 stitches). When A.2 has been worked the sleeve measures approx. 40-39-37-36-34-33 cm from the division. 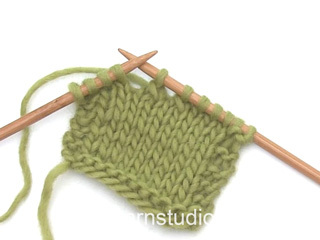 Knit 1 round where you decrease 6-6-6-10-10-10 stitches evenly spaced = 66-66-66-80-80-80 stitches. Knit 1 round where you decrease 30-28-26-38-36-34 stitches evenly spaced = 36-38-40-42-44-46 stitches. 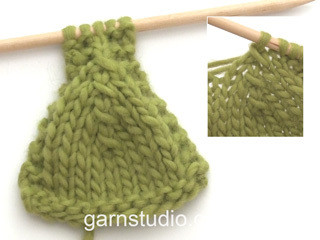 Change to double pointed needles size 4.5 mm and work garter stitch in the round for 4 cm. Cast off with knit. The sleeve measures approx. 45-44-42-41-39-38 cm from the division. Work the other sleeve in the same way.